Commit Lozenges Review and Results - Do Commit Lozenges Work? Commit Stop Smoking Lozenges are FDA-approved and contain nicotine, delivering a lower dose than conventional cigarettes at a slower and more controlled pace. Nicotine addiction caused by smoking cigarettes creates a powerful craving when smoking is stopped; the lower dose of nicotine contained in Commit Lozenges helps to fight the cravings caused by nicotine withdrawal and to break the smoking habit. Commit Lozenges are available in two strengths: 2 mg or 4 mg of nicotine per lozenge. The manufacturer of Commit Lozenges recommends using the 4 mg strength if you generally smoke your first cigarette of the day within the first half hour after awakening. If your first cigarette is usually more than one half hour after waking up, then the 2 mg strength is appropriate. To maximize your chances of stopping smoking using Commit Lozenges, you must use a minimum of nine lozenges per day for the first six weeks of the program, but no more than twenty per day, and no more than five lozenges in any six hour period. It is important not to chew or swallow the lozenge, as this may cause the nicotine to be delivered too quickly and result in unpleasant side effects, such as hiccups or an upset stomach. During weeks seven through nine of the program, the recommendation is to take one lozenge every two to four hours, and for weeks ten through twelve, you take just one lozenge every four to eight hours. It is important not to eat or drink anything for fifteen minutes before consuming a lozenge, or while the lozenge is in your mouth. The active ingredient contained in Commit Lozenges is nicotine polacrilex. Other inactive ingredients may include (depending on the flavor chosen): aspartame, flavor, calcium polycarbophil, magnesium stearate, potassium bicarbonate, mannitol, sodium alginate, xanthan gum, and sodium carbonate. 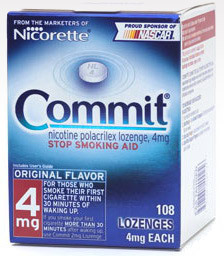 You can buy Commit Lozenges at a number of online retailers (Drugstore.com and Amazon.com, for instance) and also at many local merchants such as Walgreens, Target, Rite Aid, and CostCo. Prices vary by lozenge flavor, quantity in the package, and retailer, but a typical price for a 72-lozenge package is Target's price of $34.29. Larger packages result in a smaller per-lozenge price; for example, CostCo sells a 168-count package for $69.99. Lower prices may be available from the many online retailers who sell Commit Lozenges, but look for a free shipping special, or be sure to factor in the cost of shipping and handling. Glaxo Smithkline, the manufacturer of Commit Lozenges, seems to realize that the program is expensive, especially during the first six weeks when nine lozenges or more are required daily. The manufacturer publishes many $5 off coupons for use when purchasing their Commit Lozenges product. Customer testimonials regarding the Commit Lozenges program are mixed but generally favorable. One study containing over 150 user reviews found that the average rating for Commit Lozenges is 3.7 out of 5 stars. Many users note that Commit Lozenges helped them to stop smoking, but a number of the successful quitters became addicted to the lozenges themselves. This is not surprising, since the Commit Lozenges contain nicotine, a highly-addictive substance. Consumers who are still using the Commit Lozenges note a number of side effects, ranging from gas and digestive upset to tooth decay and other dental problems. Some users have complained of serious issues with their teeth and gums that cost them thousands of dollars to address. While Commit Lozenges have a fairly good success rate in helping smokers to stop, the nicotine they contain means that users are still consuming a dangerous substance, albeit at lower levels. Nicotine has been implicated in many diseases and conditions, including cancer, increased blood pressure, fatigue, and a weakened immune system. It is also interesting to note that nicotine is a key ingredient in many pesticides. Despite Commit Lozenges' success in helping people to quit smoking, we don't recommend it due to the nicotine it contains and to the many side effects that users have experienced. A much better smoking cessation alternative is an all-natural herbal product without nicotine; these products can control nicotine cravings and manage the side effects from nicotine withdrawals without subjecting your body to dangerous ingredients. Herbal stop smoking products contain natural ingredients that help you manage nicotine cravings while you're quitting.